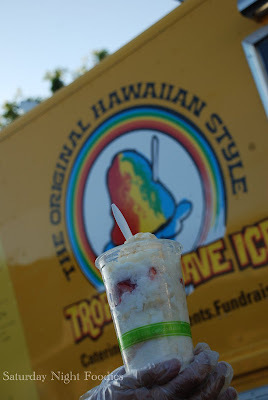 At a preview event for the OC Foodie Fest last month, Kim and I finally had a chance to check out Tropical Shave Ice. @TropShaveIce as they are known on twitter, launched in May and have been on fire ever since. That may sound like a funny description for a Hawaiian Shave Ice Truck but once you get a taste of what owner Rick and his family are serving up I bet you will become as addicted as we, and so many others, have. They offer shave ice, with a variety of flavors like banana, cherry, orange and passion fruit. They also have suggested flavor combinations such as “Da Kine” which is pineapple, guava, coconut or “OC Lava” made with coconut, lilikoi and strawberry. You can add various toppings like a snowcap (sweetened condense milk), mochi balls, or li hing mui powder – a salty, sweet and sour flavor that is popular in Hawaii. They offer Fusion Shave Ice, which is shave ice, mixed with fresh fruits and topped with sweetened condense milk. You have the option to add Azuki beans, vanilla ice cream, mochi balls or lychee jelly. This is true Hawaiian-style shave ice. This should not be mistaken for a snow cone. It is not crushed ice with manufactured, thick, sugary syrup. 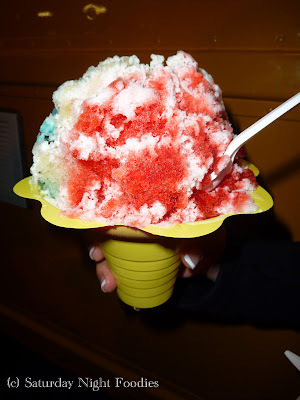 Their shave ice is like a soft, powdered snow with flavorful, fruity goodness. They make all of their own syrups, made with real cane sugar and natural flavors, which is one of the things I like most. As a kid whose family vacationed in Hawaii and later moved there, I have not enjoyed a shave ice in many years. Tropical Shave Ice syrups are all about flavor that tastes like naturally sweetened fruit. Pineapple Upside-Down Cake – Da Kine! 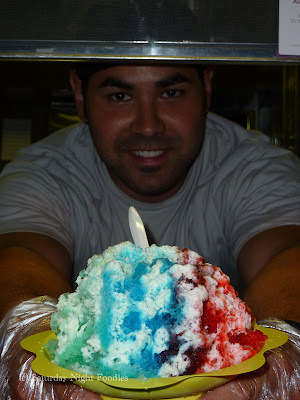 In addition to their delectable shave ice, one of the specials they sometimes have is pineapple upside-down cake. It’s a moist and wonderful cake that is so delicious in its simplicity. You just have to try it. “Kainoa” with EXTRA Li Hing Mui and Snowcap! “Keanu” with EXTRA Li Hing Mui and Snowcap! Tropical Shave Ice is one of the things I look forward to most when cruising for food trucks. And it’s not just the shave ice. Rick and his family are always super cool and welcoming. When you are with them, you are treated like family. They go out of their way to make sure you know how much they appreciate your business. Rick has also been a driving force around the OC edition of DinDin-A-GoGo. He is rallying other gourmet food trucks to help bring more trucks and new flavors to the OC. This free event, which started two weeks ago, takes place every Wednesday night at the K1 in Irvine. If you see their big yellow truck nearby, stop and grab yourself a shave ice. It will be an experience like no other. Those are some massive tubs of ice! Better keep some Excedrin handy for the inevitable brain freeze. Last week I tried a Malaysian dessert called Ice Kacang, which is shaved ice with palm sugar, sweet red beans (azuki), creamed corn, longan fruit and various jellies (coconut, aiyu and grass). Was actually pretty good. I still get brain freeze every time I eat one of these. I just cannot help it! The Ice Kacang sounds very good. Where did you find that one? It is amazing what people can do with ice when you add great ingredients!